The second indigenous Arihant-class SSBN, INS Aridhaman, is completely outfitted and ready — the production time of some 10 years from the time when the special steel was first cut at the Vizag special projects facility. It doesn’t quite match the time needed to produce the Ohio-class SSBN rolling out of the General Dynamics Electric Boat facility at Quonset Point, Rhode Island, and Groton, MA, which complex has by now manufactured over a hundred SSBNs and SSNs for the US Navy. But India is well embarked on the SSBN manufacturing front. Aridhaman will be fueled up ten days from today, i.e., around September 5, and the more powerful nuclear reactor in it (than in the Arihant) will be fired up soon thereafter. The vessel will then be ready to undergo harbour trials and conduct shallow dives before the trials take to the open sea. Not too long ago, the Chinese Navy launched its Liaoning-class aircraft carrier with much fanfare. It will take PLAN 15-20 years to integrate the carrier into fleet ops. India’s more strategic riposte with the Aridhaman, especially with the continuing eyeballing situation in the Doklam area of the trijunction, is a perfect reminder to the Central Military Commission headed by the recently anointed “Supreme commander of the people’s army”, Xi Jinping, that it won’t do his regime any good exercising the intimidation techniques of threatening, huffing and puffing, feints, etc. recommended by the ancient Confucian strategist Suntze in lieu of actual action. If the hope is that a sufficiently cowed adversary will back down, India’s posture to-date will have belied it. India is not backing down. So Beijing has a choice of withdrawing as gracefully as it possibly can, and lose face partially. Or, stick on and lose face totally. The Aridhaman, moreover, has 8 tubes to launch the K-4 2,500 km SLBMs — twice the number of tubes as the Arihant, and can carry some 24 land-attack K-15 missiles as well. The twin SSBN set will by end-2018 be able to drop a whopping nuclear load on Shanghai and the coast line to the east and west of that metropolis — the main wealth-generating region of China. Not a bad thing for the 2nd Artillery Strategic Forces to keep in mind. Meanwhile, with the second Akula-II SSN — the agreement for its lease from Russia is at the stage of crossing the t’s and dotting the i’s — entering IN service, the Liaoning will be well advised to stay clear east of the Malacca Strait. There’s general relief in the ASEAN states and the now Brahmos-armed Vietnam as also in the Far East, particularly Japan, with the recent developments in South Asia. India’s firm handling of the Doklam issue, which together with the second Indian SSBN soon showily taking to the waters, will increase manifold the confidence of the states on the Chinese periphery in India, and help douse the dragon’s fire. And its ‘tianxia’ ambition. This entry was posted in Bhutan, China, China military, Decision-making, Defence Industry, DRDO, Geopolitics, Great Power imperatives, India's China Policy, India's strategic thinking and policy, Indian Navy, Indian Ocean, Japan, Military Acquisitions, Military/military advice, Missiles, Northeast Asia, Nuclear Policy & Strategy, Nuclear Weapons, Relations with Russia, Russia, russian assistance, South Asia, Strategic Forces Command, Strategic Relations with South East Asia & Far East, Vietnam, Weapons. Bookmark the permalink. The MEA says that the BrahMos deal never took place. There has been no official confirmation. Isn’t it a bit much to assume that Vietnam is now “BrahMos armed”? Arming is a 2 year process. training and protocols take time to take root. MEA is the most recessive element in the country’s national security loop. It is so risk-averse, it won’t acknowledge even the obvious and, in any case, is unimportant. Any word on the reactor of the Aridhaman? Or more importantly the plan for the SSN reactor? Ha Ha Ha! i see some proud cheekiness creeping back in. hopes! Is it manudactured in India? if yes, by whom? what percentage of components are imported? Totally indigenous SSBN,like INS ARIHANT it had been conceptualised in 2011. Please check in Mr. Karnad’s articles on this one. We need at least 30 nuclear SSNs ready to secure Indian ocean and to venture into the South China Sea if necessary. I see no point in the expensive SSBNs. Can’t we disperse our nuclear missiles on truck mounted canisters? There is no way all of them are taken out by a first strike by the adversary. We can even store some of the missiles in ready to fire configuration deep in the mountains. SSBNs will turn into white elephants. We will end up spending time and money on protecting them instead of those toys protecting us. First Define what is the objective. 30 SSNs is a 30 year process, with the economy growing to $10-15T to support it. The path to 30 SSNs goes thru 6 SSN, 6 SSBNs, 18 Diesel Electrics, which over 30 years convert to nearly all Nuclear power. Again whats the objective? Always remember India is shaped like a peninsula (carrier bow) flanked by Andamans and Lakshwadeeps (destroyers). This is a beautiful geography to defend and dominate the Indian ocean. Rest is in the mind. Resources can be managed adequately over time. I think that we need make SSBNs if Indian Navy wants to have a Blue Water Navy. The pithy, articulative and equally importantly, well informed writers who are also bravely or naturally aligned to the future of India(the great power that it may become…your book) do not write regularly in main newspapers. Sirji, is the range of K-4 not 3500 km? The article mentions 2500km. Anyway, beautiful article sirji. Lets send a copy of article to Jinping. I like to be conservative on the SLBM range. As Mr Karnad predicted IAF asks for more Rafale. Mr. Karnad’s prediction never goes wrong. Hope this time with Modi govt. Tyagi episode will not happen. All powerful countries have internal order. With fake saints and systemic and systematic corruption we need no outside enemies.Our people are sufficient and this Aridhman,arihant,dushyant,yudhistr…..are not simply capable of fighting in that space! Shame on us for running the country like this. Its high time the country is reinforced properly to a monolithic state. Deeply satisfied that the second sub is getting ready. Because since 1947 this country was thrown to vultures, it was a weird hangover of the Arabian & British slavery. India should &will rise again like Russia & Israel, hope so. Dreaming does help – albeit, for a short period. Good to see investments in defence technology paying off. It is time we setup chip design & fabrication in India big time. This combined with our software development capability should give a big push to localisation of electronics like night vision , comm sets, batteries. 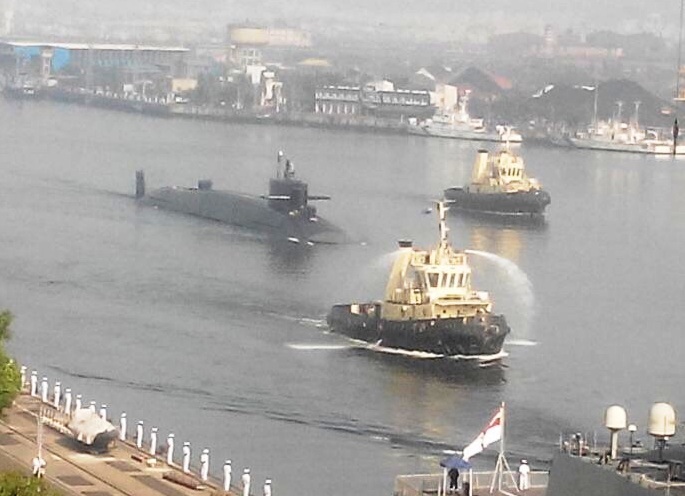 By the way your twitter on the submarine is not Arihant, looks more like an American N-sub ! Sorry about the original pic featured. Changed it but not before many eagle-eyed bloggers had spotted the mistake! My question is that will the Indian Navy be able to hold its own & make common course regarding the R&D issues,like ISRO & DRDO ? I mean in context of indigenous manufacture of VARUN Torpedo missiles & SLBM missiles like K-4 ? Because as you have mentioned, yourself sir,many times before that L&T is making submarines,will the same model will be applied after 10 years in other aspects as well like missiles ? Sir,when will mirv missiles deployed on indian nuclear submarins.What would be yield of each mirv.How many mirv could be deployed on each k4 missile. Think value C targets. Re: MIRVs the design has been on the shelf for the last 15 years, No Indian govt starting with Vajpayee’s has had the guts to order its testing and induction. who is stopping us to test mirv?. If pakistan and china can do ,dont understand what is reason that india is afraid of? Let’s just say the Govt, ever mindful of Washington, has for over a decade stopped the country from getting MIRVed missiles. This Arihant+Aridaman combo is very well balanced. Not all of countervalue targets inside china will deserve the bigger unitary nuke warhead. While will some of the targets will need more than one of the bigger unitary nuke warheads. This combo maximizes the ranges for all the given set of warheads. When you conjunct using ‘and’ and then end the sentence with ‘as well’, it creates a bit of a confusion for me. Case 1 – Eight tubes for one K-4 each plus six tubes for three K-15 each. Case 2 – Eight tubes capable of holding one K-4 each or alternatively holding three K-15 each. The K-4/K-15 missile mix would depend on the deterrent/strike mission, won’t it? Sir this is an excellent piece. If I may, is it the case that the real range of the Agni-V missile is 8500km? In addition, how many Agni missiles does India have? More or less than 50 or more or less than 100? Look, some people do claim the 8500km range for A-5. But re: performance of missiles, my conservative take is 5,500Kms-6,000kms. The number of missiles is, among other things, a function of the amount of weapon-grade material at hand. That makes a lot of sense. One would assume, per your book in 2008-9 that at least some “civilian” facilities were used for weapons grade material production? Assume 2-3 missiles of Agni-1,-2,-3,-4 per year, then maybe 36 A-1, 36 A-2, 24 A-3 and 24 A-4? That would tally sort of with the FAS estimates of 125 odd warheads? I have to say, it is so nice of you to respond to these questions and interact with us. For this you have my sincere thanks. I have always wondered if part of the civilian reactors not under safeguards are indeed being used in low burn mode to derive WGPu? @Resume nuclear testing — Perhaps, what you say makes sense. Sir, assuming the Pmo does decide to resume testing having worked out a plan to contain the diplomatic repercussions of resuming Nuclear testing, do we have the technology to successfully test a fusion device or are we looking at more duds? Does computational testing amount to nothing? India is suffering in terms of poverty, illiteracy, health and inequality but defence spending must override all these important factors! Question is: what is the point in eradicating hunger and disease, providing education and good medical service and justice for ALL people when billions uoon billions of dollars can be spent on weapons of mass destruction? Either way, people lose out – such irony! It proves only one thing: India’s loss, overall. This has already begun due to sustained efforts in procuring deadly weapons rather than eliminating the numerous ills in Indian society. SHAME. Not sure if you are expressing your opinion at the right forum regardless of its truth. This is a blog dedicated to geostrategy, foreign policy and national security affairs. Dr. Karnad, any idea as to the size of the reactor? last year I heard it was around 125 MWt with 18-20 MWe while more staid analytical presentations put it at a more modest 100 MWt or approx 16 MWe. The K-5s and A-5 are most likely MIRVable, but as the late Kasturirangan Sir apparently used to say, testing atleast 5 times is the metric for validation of capability. PS: the ‘Ababeel’ test is likely a Chinese browbeating feint and if we go one step ahead the very utility of MIRVs is questionable even for deterrence against China (outright nonsensical in Pakistan’s case) . It is at best a ‘good to have’ thing and a technological achievement if viewed as such. If a single 100 kT warhead hitting Shanghai and Beijing is not ‘deterrence’ , then none is. .”a single 100 kT warhead hitting Shanghai and Beijing is not ‘deterrence’ , then none is. This sentence should be enough fir china to hit ibdua at several points . There is no oretense of india ing a peaceful lawabiding country now. It is tge stupid delusional indians who are provoking china at american instigation heloed by our inferiority complrx. We are 5 decade behind china in everything for your infornation. Our helousy will not maje us a piwerful nation -forget superpower delusion.